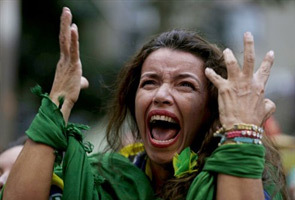 BELO HORIZONTE: The final humiliation came when Brazil's loving fans started cheering the opposition German team as they scored their seventh goal -- the nightmare the World Cup hosts had feared returned. Brazil had already left many of their supporters in tears, and as an abysmal performance in the World Cup semi-final on Tuesday worsened the Selecao stars saw hundreds start streaming out of the Mineirao stadium. The boos rang out around the ground as four, five, six, seven goals went past Brazil goalkeeper Julio Ceasar. When German substitute Andre Schuerrle got his second goal and his team's seventh, the boos turned to cheers for the team who had smashed home hopes. 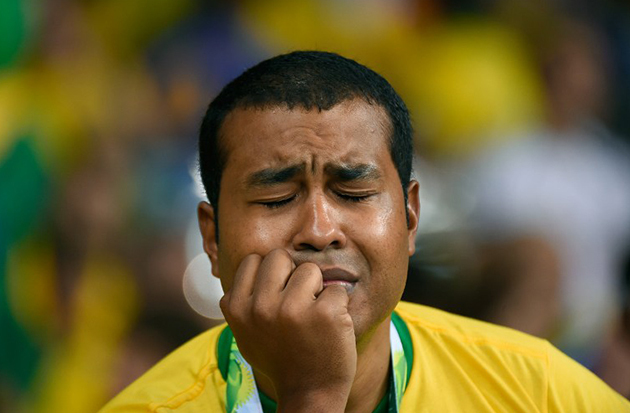 "That never happens in football," said Brazil fan Dante Santos, who was in the stadium. Before the game, some Brazilians fans had taunted German counterparts by singing "Go home, go home, go home, take your sausage, take your beer and go home to Germany." But there was a scene of desolation when Mexican referee Marco Rodriguez finally called a halt to the slaughter at 7-1 -- Brazil's worst defeat in its 100 years of competitive. Team captain Thiago Silva, suspended for the game and still wearing a baseball cap bearing the name of injured striker Neymar, went onto the field to embrace midfielder Oscar to hide his tears. "Even Germany couldn't believe what was happening," said Brazil coach Luiz Felipe Scolari as he and leading players begged forgiveness. "Apologies to everybody, apologies to all the Brazilian people," said a tearful David Luiz, the stand-in captain. "I just wanted to see my people smile. We all know how important it was for me to see all of Brazil be happy, at least because of football. "They were better than us. They prepared better. They played better. "It's a very sad day but it's also a day from which to learn." Fans from football's superpower had come to the stadium expecting to see a football fiesta by a team hoping to win a sixth World Cup trophy -- normally made easier by playing on home territory. Instead it became a night as bad as when Brazil lost the deciding 1950 World Cup match to Uruguay in Rio de Janeiro's Maracana stadium. That defeat traumatized the nation and became known as the "Maracanazo." 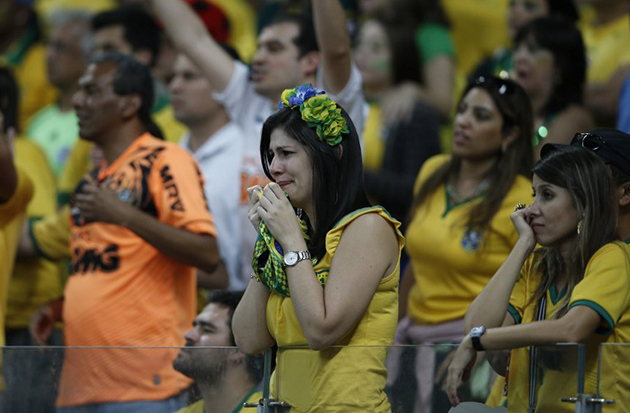 Television commentators quickly called the Belo Horizonte humiliation the "Mineirazo" to revive memories of 1950. Brazil players started the ceremonies by kissing the number 10 jersey of absent star striker Neymar. Luiz and Cesar held up the jersey during the playing of Brazil's national anthem and kissed it afterwards. 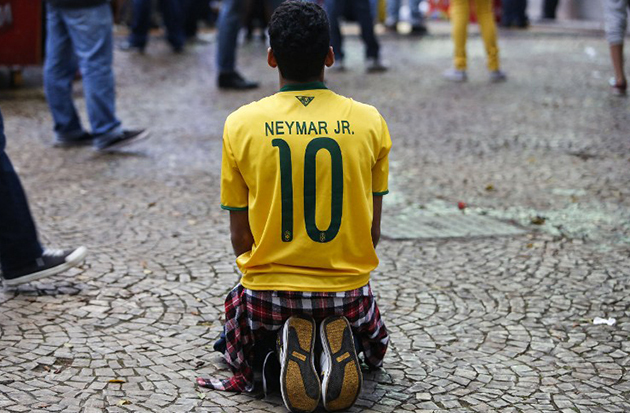 A roar of "Ole Ole, Neymar, Neymar" rang around the stadium as the match kicked off. Brazil has been gripped by the Neymar saga since the Barcelona striker was kneed in the back during Brazil's quarter final win over Colombia. At first it was like a national tragedy, but it became a rallying cry as the national team moved into the semi-final. Scolari and his players wore the baseball caps with the slogan 'Forca Neymar' (Go Neymar). Duting the match, suspended skipper Thiago Silva buried his face in his cap unable to watch. Scolari, who won the World Cup with Brazil in 2002 and took Portugal to the semi-finals four years later, admitted the day had been a nightmare..
"I think it was the worst day of my life, but life goes on," said the 65-year-old. "I will be remembered as the coach to lose 7-1 but I knew that risk when I took the job and life goes on so that is what I am going to do." "My message for the Brazilian people and fans is that we did what we could do and we did what we think was our best," he said bravely. Apa mandat Jokowi menjelang kempen akhir Pilpres?